Just a heads up! Our 90’s Hip-Hop Class Wednesdays at City Dance Colton SF will be moving to a different location starting August 1st! We will be moving to City Dance MJ’s Lab at 301 8th St. Suite 200 SF (*Keep pressing “A” on the entrance keypad and search for “CityDance” to get buzzed into the building). Class time will remain the same from 8:15-9:30pm. 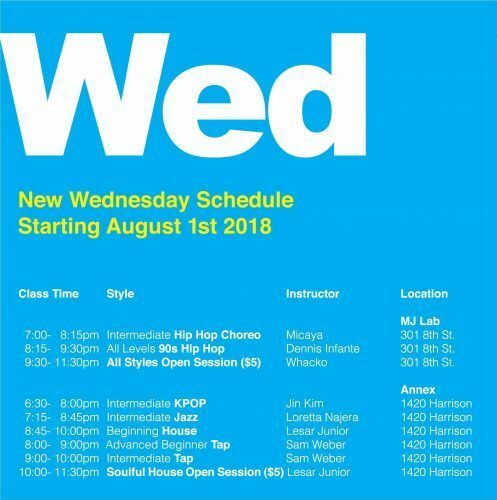 There will also be an open session (all-styles welcome) hosted by Whacko, Jaypee, and I immediately after. See you then!